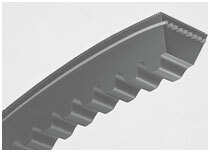 Rawedge cogged MAXSTAR WEDGE V-belt. Combines advantages of both wedge belt and rawedge cogged belt. High power transmission capacity belt. Permits economical and space saving drive design.